At the heart of Dalston’s boulevard de la renaissance, A Little Of What You Fancy is unpretentious and welcoming. A Little Of What You Fancy is a no-sign, ‘underground’ restaurant on a stretch of Kingsland Road officially (yes, officially!) known as The Waste. While this may not sound too inviting, these days you’re more likely to sustain a laughing injury due to the hats, shoes and facial hair of the Haggerston hipsters, than be accosted by the once ubiquitous Crack-fiends that patrolled this area on nights of yore. A visit here is a pleasure, so much so that it seems churlish to mention the imperfections, such as a slightly over-salted salt and chocolate tart, or a piece of horseradish butter refusing to melt on a well-rested steak. Yeah, I know I just mentioned them, but that was just to get the tommy grumbles out of the way. The restaurant has an atmosphere that manages to be both ‘different’ and relaxed at the same time. The room smells of delicious food as soon as you walk in. It makes you think – yes, I want to eat here. I can smell grilled prawns and I want some. Service combines charm and the sense of ownership and participation that you get from staff in the best places. Our waitress didn’t miss a trick – just saying the words “two jugs of wine” in casual conversation resulted in two jugs of wine being whisked to our table, one white one red. It felt like accidentally bidding on an item at an auction, but then being quite pleased with what you accidentally bought. When ordering pork belly you are really only thinking about one thing – crackling – and here was a cracking example of one of the finest foodstuffs known to man. This crackling had me salivating like one of our old Crack-head friends smoking Crack in a Crack-house, I’d say this crackling was more addictive than Crack. Give me good crackling and I’ll forgive whatever rough edges you want to try me with. Salted caramel ice cream can do the same thing. So what’s so underground? Well, I did mention there’s no sign. If you want to find this place just look for the vacant-eyed, zombified crackling-fiends that now wander this stretch of The Waste. 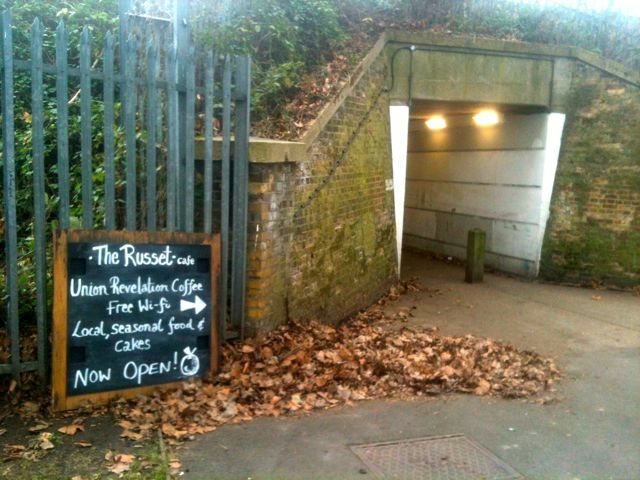 The Russet, tucked away in Hackney Downs, is doin’ it and doin’ it and doing it well. Hells yes! The Russet is one of those places that gets it right on every level. First of all it’s a discovery, you have to search it out, it is tucked away on Amhurst Terrace amidst the newly established Hackney Downs Studios. Whichever way you approach the place you have to walk down a scary ginnel to get there. The exterior is in contrast to the surrounding buildings and appears like a oasis in a desert of unloved industrial units. 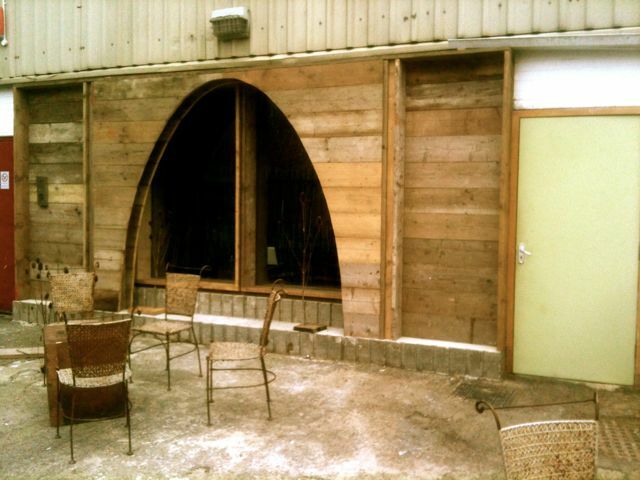 The Russet is also in an industrial building but they’ve given it a handmade facelift with a beautiful arch made of scaffold boards. Inside more imaginitive and creative space design, a corridor formed of old joists allows you to see into the café space but leads you to the counter, where the first thing you see is a nice, shiny La Marzocco coffee machine. The next thing you see is how big this place is. Unlike a lot of new startup coffee places this is spacious, it’s still comfortable and cosy even, but it’s in no way cramped. I ordered a long black, not too long. The difference between a long black and an Americano, as any fule kno (RIP Ronald Searle), is the order that the water goes in. For long black the water is already in the cup to which the espresso shots are added. The trainee barista didn’t seem to know this (clearly no fool), but his trainer put him straight, and also told him that the first thing we need to hear after a coffee order is the grinder. Fresh. I was happy with my coffee, they use Union beans, which (whisper it) I happen to use at Tommy Towers, so it was a pleasingly familiar taste, served in a nice simple cup with saucer and a cool little spoon. There’s a sandwich menu, cakes and pastries too. The Russet is serious about local produce and seasonality, they do their own chutney, cakes are made with what’s in season, so there was the smell of mandarins in the air. They have plans to grow their own produce too in a garden area at the back! 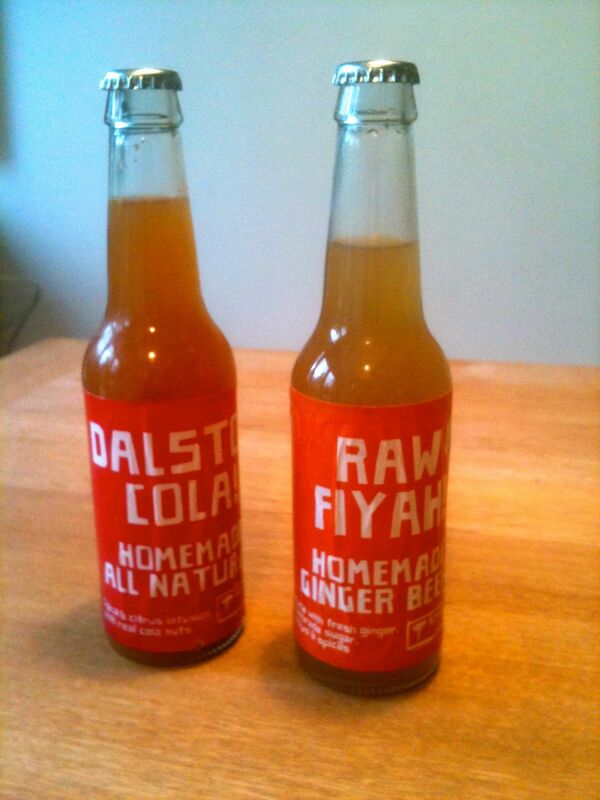 Oh yes, and get this, they make their own cola!!! Yes I said it. I just had to get some of that, takeaway though cos coffee and cola is too much even for me. I can’t wait to crack it open. Saturday at The Russet is the Cider Sessions, where they have live music, real cider, local London Fields ale and a big old party. There’s so much to say about this place, from the music, to the space, the design, the name (if you’ve been paying attention to my blog you’ll know that russets are my favourite apples), the care and attention to detail. They’ve only just opened but it looks like they’ll go from strength to strength. Seek it out, it’s literally. Off. The. Shizwang. 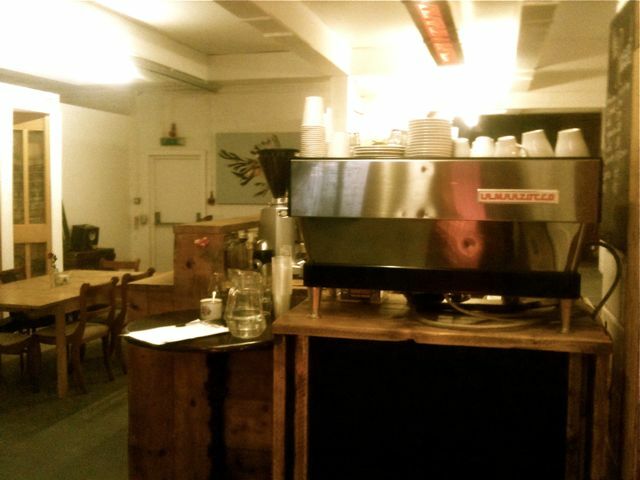 The Russet, Hackney Downs Studios, Amhurst Terrace, E8 2BT. 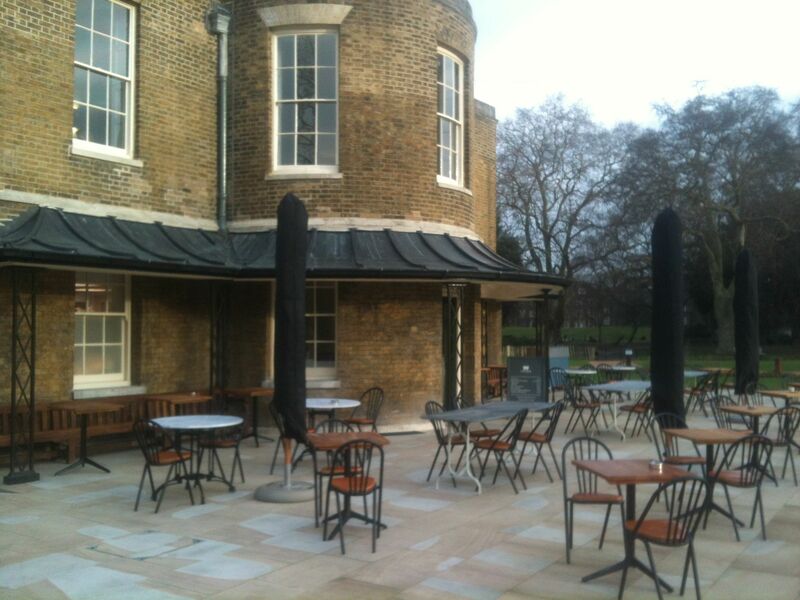 Clissold Park House opens with upmarket café. Oh I forgot! In all the wind, rain, fare increases and back to work malaise of yesterday I forgot that Clissold House café opened its doors for the first time in it’s new guise. I happened to be passing this morning and saw the tables set up on the west terrace which jogged my memory. I didn’t have time for a full reccy but there’s always time for a double espresso. The house and the whole of Clissold Park have been undergoing refurbishment for well over a year now and things are starting to take shape. The contract to run the café in the house was awarded (with some controversy, but not much) to Company of Cooks, who run the hospitality concessions at some of London’s most glamourous locations including The Royal Opera House, Kensington Gardens, Kenwood, Regent’s Park, Hyde Park etc. The controversy was that local providers were effectively excluded by the council as they only opened the tendering process to organisations with turnover of £1million+. Anyhoo they’re in now so let’s see what they got. The coffee menu (printed on an ‘A’ board outside) is old school. No flat white, long black, pour-overs or aeropress, they do offer a ‘three cup cafetiere’ alongside the usual americano, espresso, cappuccino and latte. Prices, despite the grandeur of the venue, are reasonable: £1.65 for a double espresso, £2.10 for cappucino or latte. The door on the west side of the building is a bit on the sticky side, so I wasn’t sure if they were open or not. A very friendly waiter opened up and told me this door was only for take away, or seating on the terrace. Fine, I was pushed for time, so I ordered my double espresso and took a chilly al fresco seat. When the drink arrived I was very impressed. What a crema! 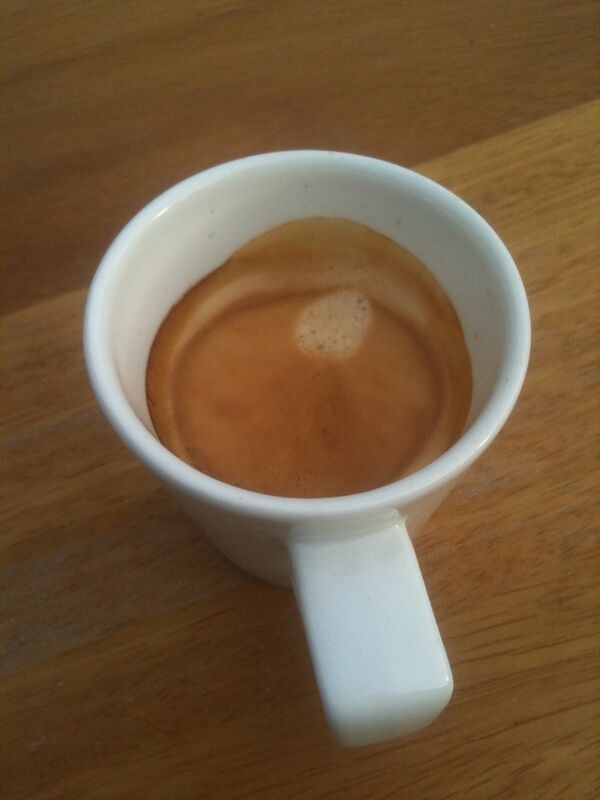 It was a thing of beauty, and served in a nice chunky espresso cup without the faff of a saucer. Great. Drinking it was a little dissapointing, but only a little. It was a very smooth and tasty cup, but not strong enough for my taste. It just lacked body. The flavour that was there was pleasant and lingered nicely too. For £1.65 delivered to the table this was very, very good. I will definitely be back. Next time I’ll go in the front door, I didn’t realise that the main entrance is on the front of the house (duh! ), and try the food too. According the the Company of Cooks and Hackney Council press release we should look forward to seasonal menus including local produce. I’ll be very interested to see on my next visit how much of the food on offer is being sourced in Hackney. The new grocer’s shop on Church Street is a welcome addition. I used to pop in and get delicious homemade samosas from the newsagents on Church Street when the Stoke Newington Farmers’ Market was held in William Patten school. They were made by the wife of the man who ran the newsagent and they were great. So I was gutted to see the notice in the window announcing their retirement and the closing of the shop. No more samosas. Bad one. 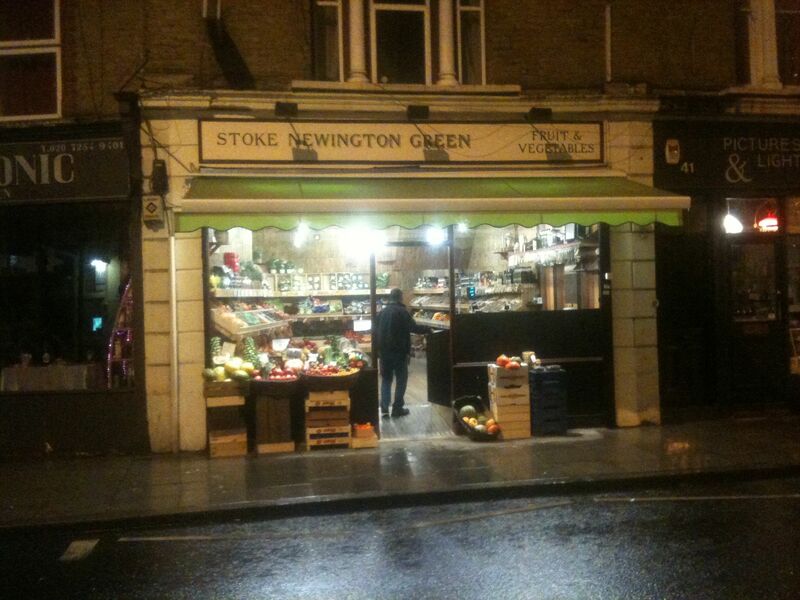 So can Stoke Newington Green compete, thrive and survive in the tough retail conditions that prevail? It’s too early to say, but they have got off to a great start. 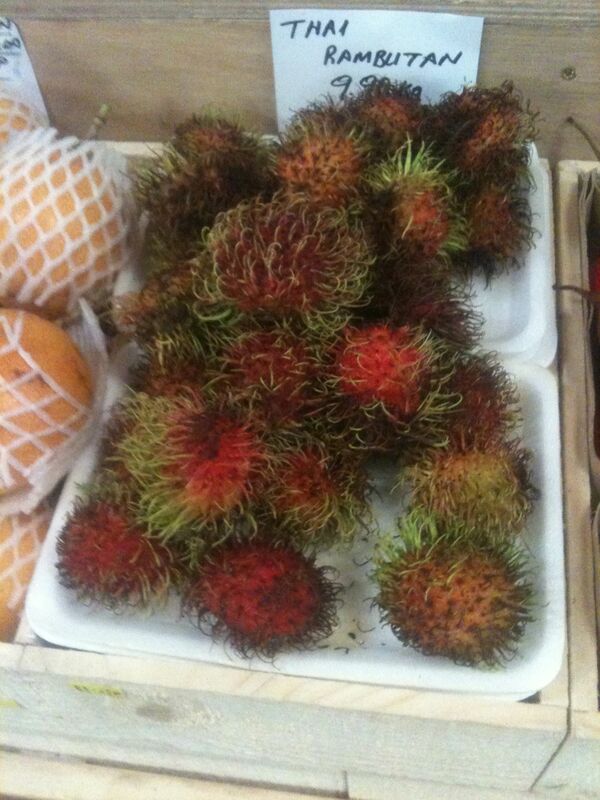 This place has a really extraordinary range of produce and it all looks in tip-top form. No tired looking fruit and veg on display here. Ten types of apple, including English grown and cooking apples, and my favourite russet apples, exotic fruit from all over the world, fresh, good quality veg including British grown baby and full-sized varieties. It’s a cracking-good fruit and veg shop. I hope more people who use Whole Foods will spot it and support a local shop instead, and I’m sure they will because this place is excellent. *I remember when Stokey residents were up in arms about Nandos opening on Church Street, but no one seems to bat an eye at shopping in Whole Foods Market whose global sales for 2011 topped $10billion. Go figure. Brewing beer with foraged hops! My mate Graham happens to be the Cellarman at one of London’s beeriest beer bars: The Euston Tap. Last week he went up to Norwich to brew a beer with Northcote brewery. Why is this a Hungry Hackney ting? Simples; Graham lives in Stoke Newington and he harvested some of the hops used in the beer from his back garden where they were growing wild. Foraged hops being used for brewing actual beer! I wanted to know more. And flower they did. 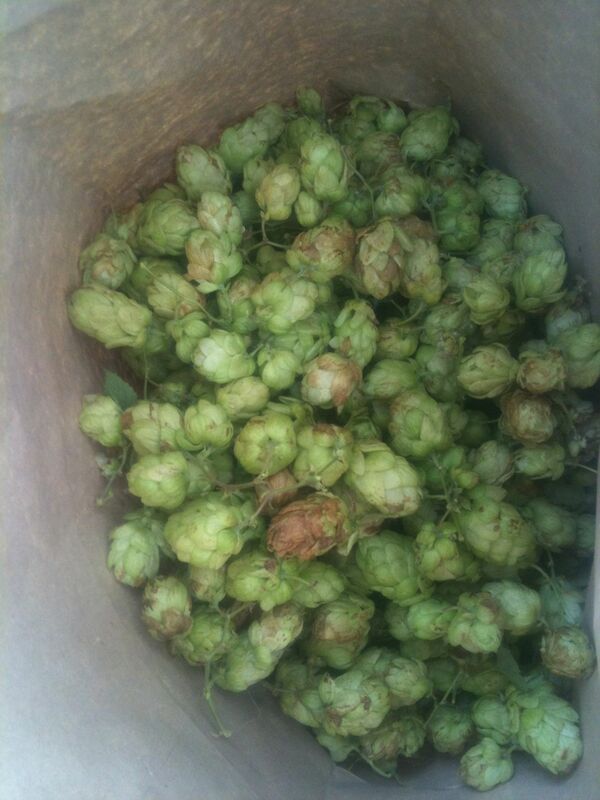 It’s the flowers, or cones, of the hop plant that are used in brewing. They give beer it’s bitterness, herbal aromas and balance out the sweet flavour of the other main ingredient; malted barley. After collecting the cones Graham laid them out in his greenhouse on shelving to dry out any excess moisture. This took a couple of days. Then he put them into freezer bags, squeezed out all the air and tied them, before putting them into the freezer to store until brew day. Keeping them in the freezer is also a good way of killing off any nasties, bacteria or insects, that might be lurking in the cones. For the brew day Graham took the hops to the Northcote Brewery in Norwich. Run by husband and wife team Adam and Jenni Nicholls the microbrewery has been producing hand crafted ales for only just over a year. 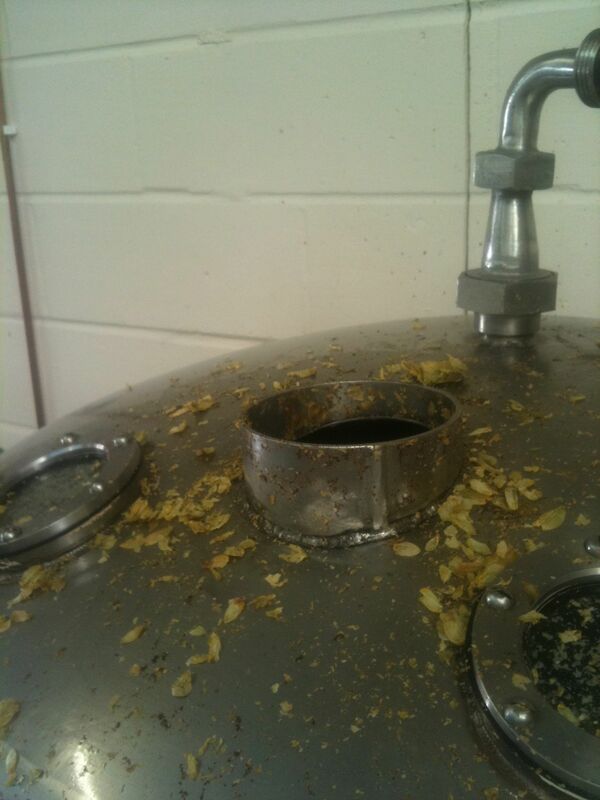 The plan was to create a highly hopped pale ale with as many hop additions as they could. As well as the Hackney Wild Hops they added copious amounts of Citra, Summit and Pacific Jade at every stage of the brewing process. The beer is going to be called ‘One For The Road’ and will be on sale only at The Euston Tap, probably around Christmas and into the new year. There will be about 16 casks of it produced, but because it uses unique wild hops, once it’s gone, it’s gone. There won’t be a chance to recreate it until the wild hop harvest next year. Foetid forage is more appealing than it smells. 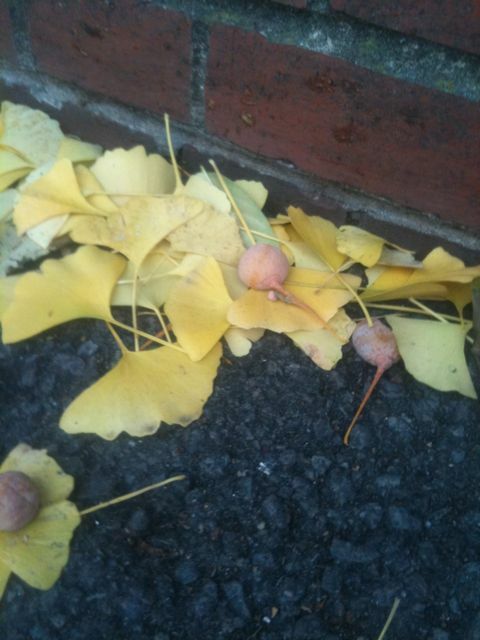 It’s mid-November and the Ginko nuts are in season. You might be familiar with the Ginko (or Maidenhair) tree because of the smell. It stinks. At this time of the year, the yellow mess of dropped fruit and soggy leaves under the tree stinks like vomit, dog-pooh and cheese (nice). A stinky tree doesn’t sound like a very promising first blog post, but I think it is. I’m excited by the dropped fruit and in some ways it sums up what inspires me about food in Hackney. If you have a little bit of knowledge and an open mind this tree yields an amazing, foraged, local, seasonal, FREE treat and, to misquote Sir Michael Caine, not a lot of people know that. There are some people who do know though, and they seem to be mainly Chinese. 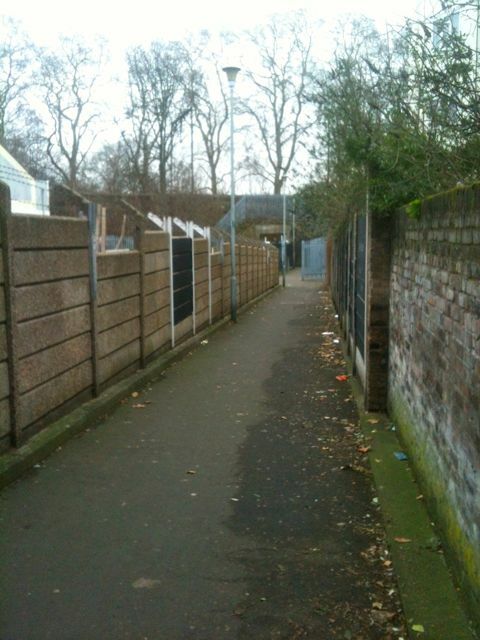 I spoke to one woman this morning who was collecting a big bag-full of the smelly windfall on Lordship Road (N16). 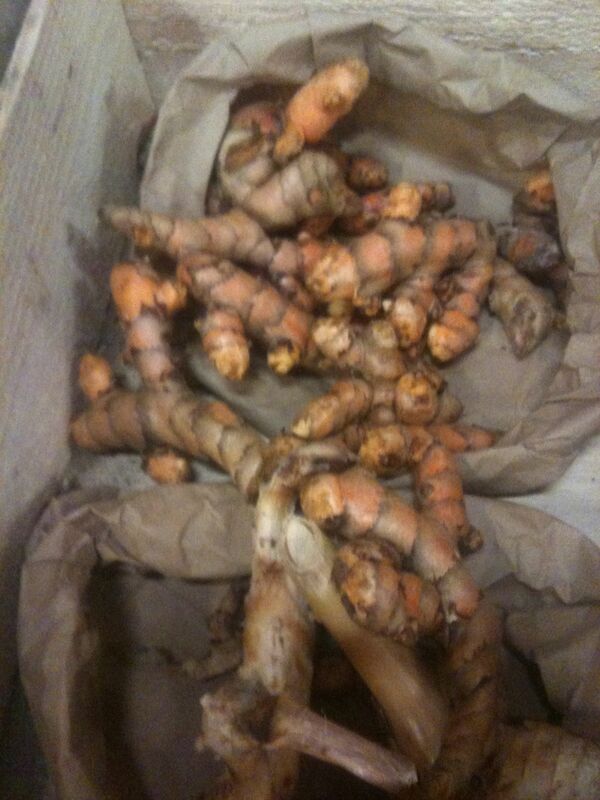 She was Chinese and was surprised that I knew about Ginko nuts. She told me that they’re very hard to buy in this country so she collects them. I guess she would do even if they were easy to buy, cos the street version is free (right kids?). She was going to use them for puddings, but warned me not to eat too many because they contain “a little bit of poison”. Wow. This nut is not only smelly but dangerous! It’s got to be good because she was collecting a big old bag-full to take home. She did say she’d freeze some of them. I love it! It’s going on right under our noses (literally) but its a secret. This is what I like about food in Hackney. There are special, exciting, seemingly secret things going on and I want to get to the bottom of them, and share them with you. If you’ve read this far then you’re probably interested in Hackney food too. So lets see what’s out there and share it.